Making your very own restaurant-style Steak Quesadilla at home may be easier than you think. 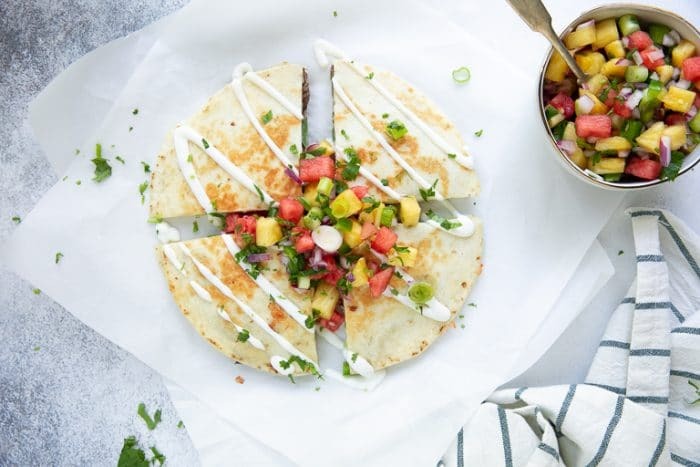 This Easy Steak Quesadilla Recipe is made with gooey melted cheese, tender pieces of steak and is served with a sweet and refreshing Watermelon Pineapple Salsa. 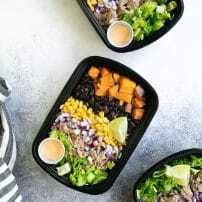 Loved by the whole family, this easy 10-minute dinner is easily customizable and delicious year-round. Anyway, quesadillas- especially steak quesadillas- will always hold a special place in my heart. They were my first introduction to Mexican food and basically acted like the gateway drug to my Mexican food eating obsession. Steak quesadillas have long been one of O’s favorites and are, once again, a constant in my life. But how do you cook cheesy steak quesadillas so that the tortilla is crispy and not burnt? I’ll give you a hint to start- not in the microwave. Don’t worry if you don’t have any leftover steak. I have a recipe for super easy soy and ginger marinated steak below. Of course, feel free to use your favorite spices or marinade. This marinade, however, has been my go-to for steak for forever and the salty sweet of the soy sauce and brown sugar taste amazing with the watermelon and pineapple salsa. There are actually more than two ways to make a cheesy steak quesadilla, however, in order to get the crispy golden tortilla, I recommend these two methods (in other words, not the microwave). In a large skillet. Whenever I need to make just one quesadilla I will always fry it up in a large skillet with some butter. Cooked on medium-low heat, the tortilla reaches a perfect crispiness (without burning) and absorbs the salty butter. Combine this with gooey melted cheese and chunks of steak, it’s hard to deny the deliciousness of the steak quesadilla. In the oven. Although I love how easy it is to cook these steak quesadillas in a skillet, it’s even easier in the oven. And, the best part about the oven? You can make a whole lot more at one time (translation- you can actually eat with everyone else). Simply build your steak quesadillas, pop them on a baking sheet, and cook until cheese is melted. Use a different cheese. You don’t have to use shredded mozzarella cheese to make a great quesadilla. 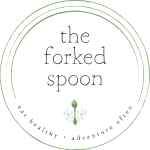 I happen to love it because it’s my kid’s favorite, it melts well, and I always have it in the house. With that being said, there’s no reason why a Monterey Jack, Pepper Jack, or Cheddar wouldn’t taste just as great. Or, you could get fancy and mix them up. Do you have to use flour tortillas? yes and no. Yes, if you want that Tex-Mex cheese and steak quesadilla kind of feel or classic restaurant quesadilla taste. No, if you don’t care about any of that and simply prefer corn tortillas. In other words, try both and pick your fav! Pick your meat. Just because this is a steak quesadilla recipe, that does not mean you have to add steak. Why not make it a ground beef quesadilla? Or a shrimp quesadilla? Or a tempeh quesadilla? Have fun with the toppings! 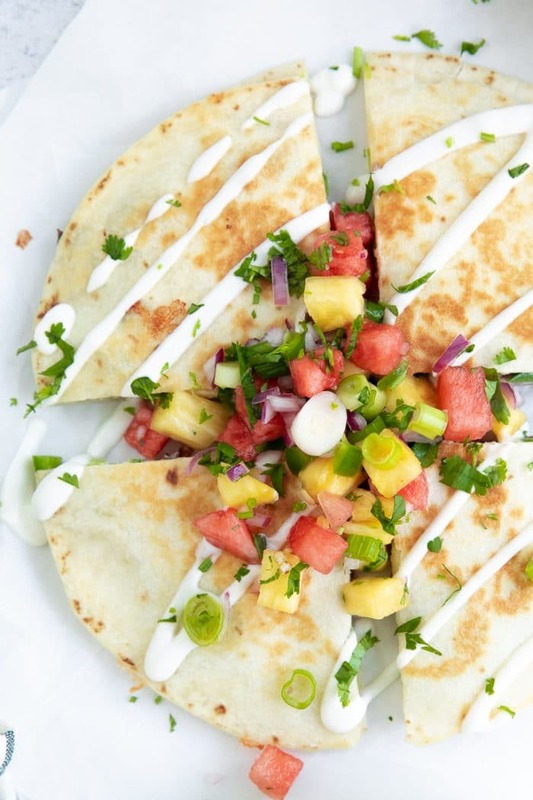 This summery watermelon pineapple salsa is perfect for right now because it’s the middle of summer, but if you find yourself craving a meaty beef quesadilla in the fall, why not try them with a homemade tomatillo salsa? 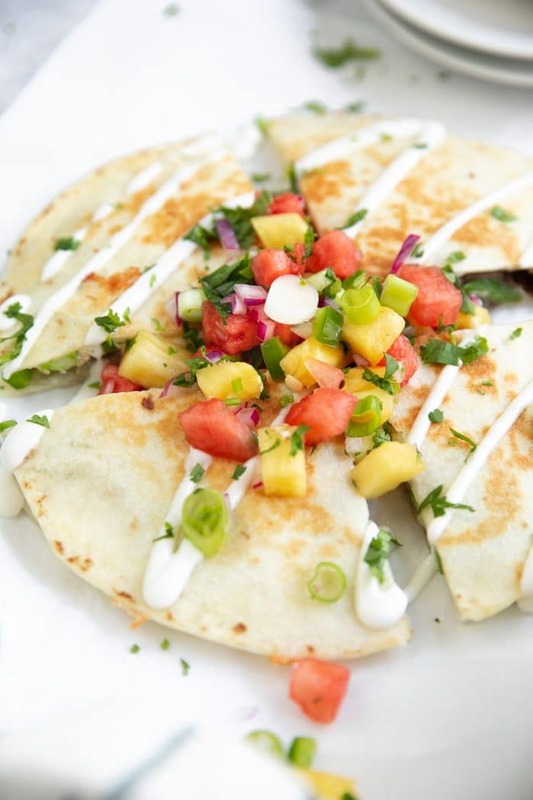 Don’t forget to check out these other quesadilla recipes! Just in case you do not have any leftover steak on hand, I have provided a steak recipe in the instructions below. Please note that this adds additional cooking time. Ground beef would also taste great. Add the chicken broth, soy sauce, brown sugar, fresh ginger, and garlic to a large ziplock bag. Seal tightly and shake well to combine. Add the steak to the bag with the marinade and seal again. Gently turn the bag over several times until the steak is fully covered with the marinade. Refrigerate until ready to cook. When ready to cook, remove steak from the marinade. Discard any additional marinade and the bag. Heat a large skillet over medium-high heat. Add the butter to the skillet swirling around to completely coat the bottom of the skillet. Once hot, add the steak to the skillet and cook to the desired level of doneness (rare, medium-rare, well-done). Remove steak from the skillet and allow to rest for 5 minutes before slicing into thin slices. 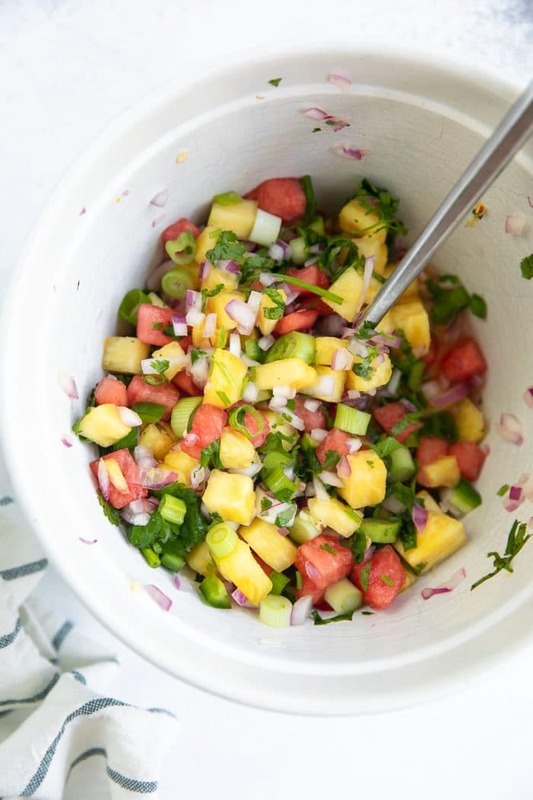 In a large mixing bowl combine the watermelon, pineapple, jalapeño, red onion, cilantro, and lime juice. 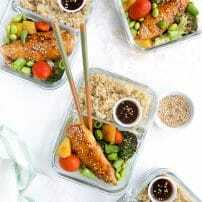 Gently toss to combine and store in the refrigerator until ready to serve. Brush two large baking sheets with a thin layer of olive oil. To each baking sheet add two flour tortillas in a single layer. Top each tortilla with 1/2 cup of shredded mozzarella cheese, followed by desired amount of sliced steak, and again with an additional 1/2 cup of mozzarella cheese. Top with remaining tortillas. Brush the tops of each tortilla with approximately 1 teaspoon olive oil each. Transfer baking sheets to the oven and bake until cheese is melted and tortillas are golden - approximately 5-7 minutes. 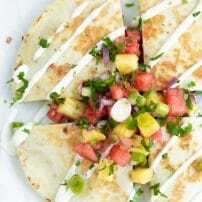 Remove from the oven, drizzle with sour cream and top with watermelon pineapple salsa. Enjoy! 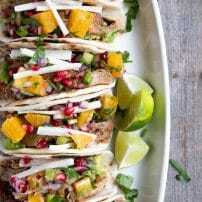 Want to try this Steak Quesadilla Recipe with Pineapple Salsa? 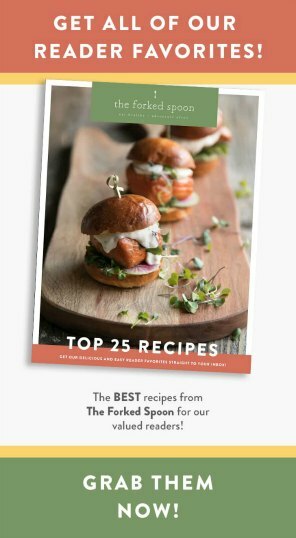 to your EASY DINNERS or MEXICAN FOOD Boards on Pinterest and save it for later!